I had one of those days where every chore I took on seemed to take forever to finish, then when I had time to work on something creative I just couldn’t seem to focus. Instead, I ended up cleaning up my work space since my drawing table often becomes a “dumping ground” for things that I’m not sure what to do with, or am too lazy to put away immediately. I decided that since I have some time set aside for my artwork next week, I might as well take the opportunity to clear things up and make it a pleasant place to work. The clutter was part of what was distracting me; all that stuff kept getting in my way! I had left sketches and supplies out for my Christmas and Valentine’s cards, so I filed the papers, put away things that didn’t belong there, and even shredded a pile of papers sitting in the shredder which lives under the desk. Now my desk is an open runway for new projects: Clear for take-off! Recently, on another organizing binge, I discovered a birthday card illustration from some years back that I had forgotten about, so I made time yesterday to post it in The Nancydraws Shop. 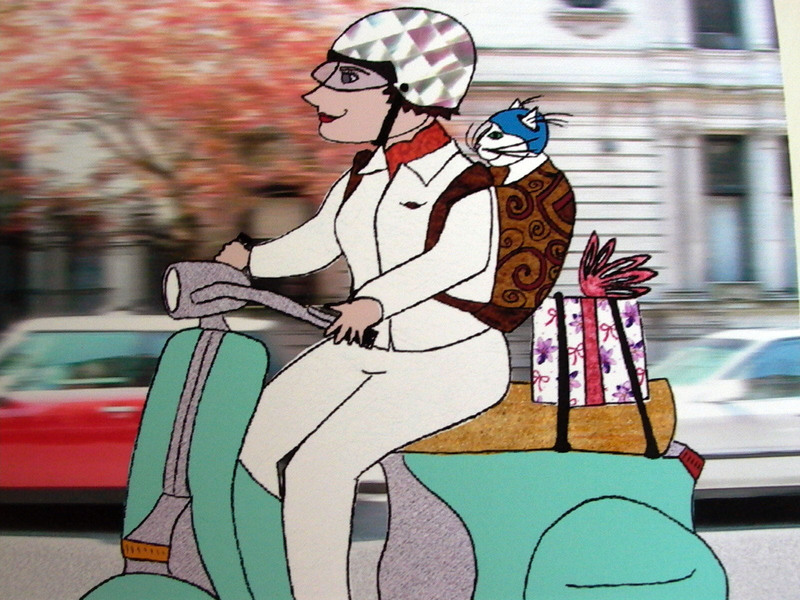 Pictured above, the card features Adele and her feline pal, Henrí, on their way to a birthday celebration. I hope you are inspired by Spring to create, clean-up, or both!